While out mushrooming this early October I met a keen amateur, just like myself but still a little rusty on identification as he’d not being doing it for long. 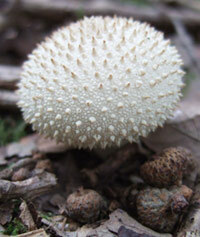 What he thought were puffballs of some kind were actually the egg sacks of Stinkhorns. One was cracking slightly, showing the sticky yellow fluid which gave it away. 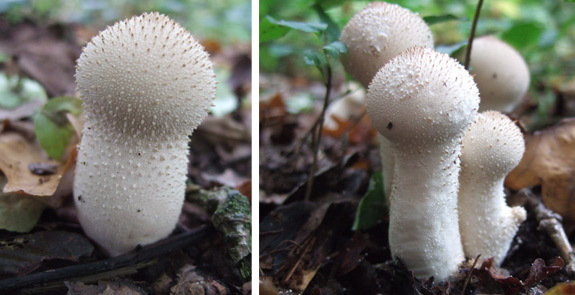 Although edible when in a young state (but not cracking open), care must be taken in identification as some egg sacks like this contain poisonous mushrooms – like a young developing Death Cap for example. Thought you might like to see my daughter with the giant puffball we found? Thanks Emma. Great blog and pics. That’s a great sized Giant Puffball! Thanks much for the excellent photos and conversations! I’m going to slice, saute and enjoy my young, white puffball, now that I am assured it’s what I thought!